The Showman’s Circle at Lake Metroparks Farmpark was completed in July 2016. Hundreds of families came out for the opening weekend. We are proud to help bring new excitement to children and their families while at the Farmpark. 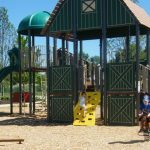 The project is one of several recent improvements and upgrades undertaken by the park and will serve as a hands-on area for kids and adults, offering relaxation, play and educational demonstrations. 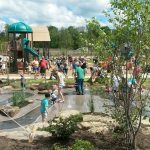 In addition to the 50-by-70-foot play structure, the enhanced area also includes a natural water feature, consisting of an interactive stream and seating fountains, a 30-by-30-foot covered barn shelter pavilion for programs and picnics and an expansive lawn and seating area.